The assignment was to show a sense of scale. Whether you were positioning two items in a frame that clearly defined the size of one or the other, or whether you were putting a frame together consisting of seemingly impossible similarities based on your point of view, you were to send in up to three prints for consideration. I decided to enter since I can always use more practice printing, dispersing, discussing, and taking charge of my photographic career. 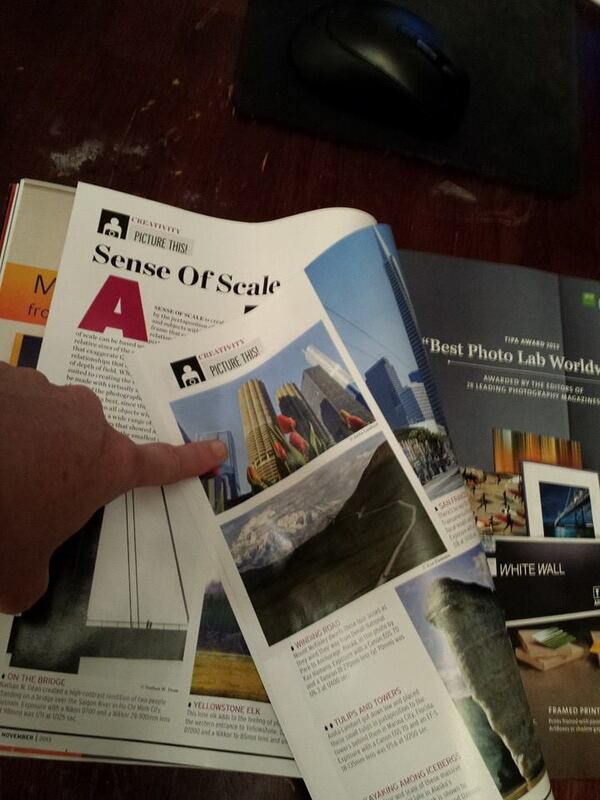 What I didn’t expect to do was to see my photo in print in the magazine! I was visiting Tom Szydelko (a very a talented photographer here in Chicago) and since he subscribes to Shutterbug (in fact, he had given me the magazine containing this particular monthly assignment), on a whim I asked him about it. After searching and finding the latest issue of the magazine, he and I started to leaf through the pages-and there it was! The shots that I was placed next to were downright humbling. It was quite an honor to be in their midst, and had I seen them grouped together without mine, I would have understood not being in there. That I had a photo right next to theirs was exactly the shot in the arm I needed (flu shots be damned! ).